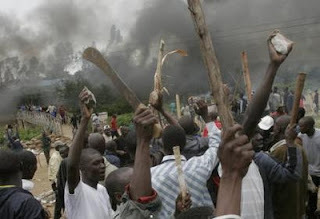 Shocking Admission: Julian Assange Says Wikileak Document Was Behind Kenyan Election Massacre But That "The Kenyan People Had a Right to the Information"
Kenya erupted in violence following a controversial presidential election in January 2008. 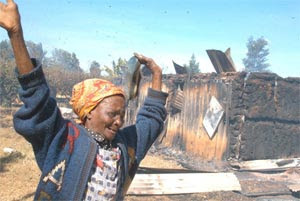 Up to 50 Kenyans were burned alive inside a torched church in Kiambaa where they sought refuge. An EU report said that the Kenyan election was seriously flawed. Vaughan Smith, the director of the Frontline Club, tells me that he’s more or less subsisted on “two hours’ sleep and two sandwiches”. But then, there’s something about Assange that if not superhuman, is almost as if sleep and food are mere technicalities that might concern the rest of us, but that he has found a way of simply dispensing with. Combat, intellectual combat, seems to be his stimulant of choice. It just fuels him. When I try to question him about the morality of what he’s done, if he worries about unleashing something that he can’t control, that no one can control, he tells me the story of the Kenyan 2007 elections when a WikiLeak document “swung the election”. The other key thing about WikiLeaks is that it’s internationalist in the true sense. “We do not have national security concerns. We have concerns about human beings,” says Assange.